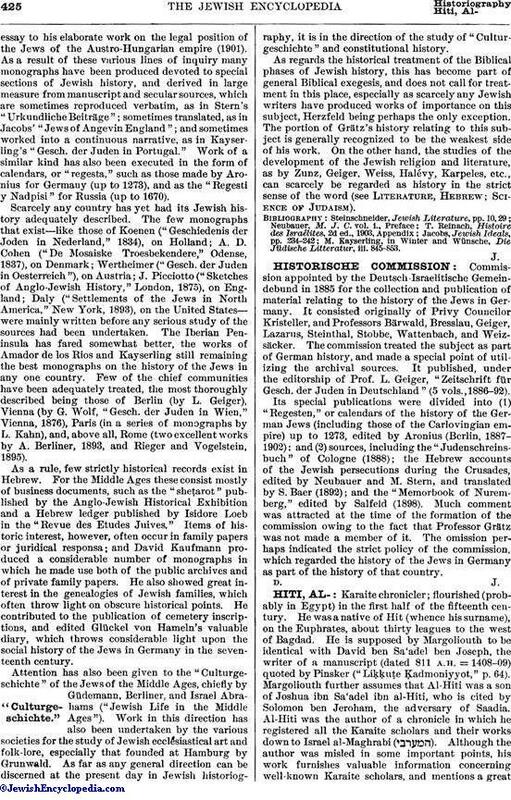 Commission appointed by the Deutsch-Israelitische Gemein-debund in 1885 for the collection and publication of material relating to the history of the Jews in Germany. It consisted originally of Privy Councilor Kristeller, and Professors Bärwald, Bresslau, Geiger, Lazarus, Steinthal, Stobbe, Wattenbach, and Weizsäcker. The commission treated the subject as part of German history, and made a special point of utilizing the archival sources. It published, under the editorship of Prof. L. Geiger, "Zeitschrift für Gesch. der Juden in Deutschland" (5 vols., 1886-92). Its special publications were divided into (1) "Regesten," or calendars of the history of the German Jews (including those of the Carlovingian empire) up to 1273, edited by Aronius (Berlin, 1887-1902); and (2) sources, including the "Judenschreinsbuch" of Cologne (1888); the Hebrew accounts of the Jewish persecutions during the Crusades, edited by Neubauer and M. Stern, and translated by S. Baer (1892); and the "Memorbook of Nuremberg," edited by Salfeld (1898). Much comment was attracted at the time of the formation of the commission owing to the fact that Professor Grätz was not made a member of it. The omission perhaps indicated the strict policy of the commission, which regarded the history of the Jews in Germany as part of the history of that country.